I've heard many times that new investors should consider building a portfolio with low-cost index funds from Vanguard. Vanguard offers recommendations to its customers, either through the use of online tools or recommendations from one of its specialists. A simple approach that I tried is responding to prompts about investing goals and style using these tools. 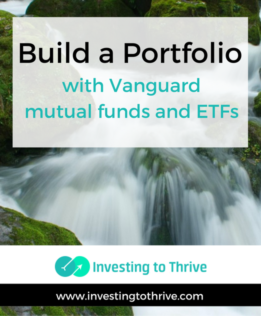 I could build either a Vanguard ETF portfolio or a Vanguard Mutual Fund portfolio. It's been developed by Bill Schultheis, author of the book The Coffeehouse Investor, who is prominent in Vanguard fund and “lazy portfolio” circles. The premise of the book and Bill's financial advisory and investing philosophy is that typical investors can't beat the market so they should consider putting money in low-cost market index funds and then directing excess energy toward career and personal interests. As a result (hopefully), the investor's life can be rich by a) focusing on generating income at a regular job or business plus b) spending leisure time doing what is meaningful and enjoyable. Note that I think investing is fun, not boring, so I haven't necessarily adopted this philosophy. Still, I thought it would make sense to peek at the investment portfolio on his website. According to MarketWatch, this lazy portfolio has delivered annual returns of 5-6% over the last 10 years (depending on market fluctuations). Mike Piper, aka Oblivious Investor (one who doesn't pay much attention to the news headlines or do much stock analysis but invests steadily in index funds), is an index-fund portfolio champion and investor. Having read his ebook Social Security Made Simple, I have come to admire his work and positive efforts toward making complex subjects accessible to the average person (like me). This portfolio is intriguing to me because of its inclusion of value stocks (large-cap value and small-cap value) and small-cap stocks (small cap and small-cap value), both of which have historically outperformed the general market. (Whether they will continue to outperform is unknowable). It also has real estate plus an inflation hedge via Treasury Inflation-Protected Securities (TIPs). These are just examples to illustrate how others have designed a portfolio. After selecting a design or making a model portfolio, the next phase is to consider buying shares of mutual funds or ETFs to build a portfolio based on the design. A portfolio could consist of both mutual funds and ETFs. But for simplicity's sake, I decided to look at creating a Vanguard mutual fund portfolio or a Vanguard ETF portfolio (but not mixing mutual funds and ETFs). Generally, the minimum is $3,000 to get started. A common minimum for an initial investment with a Vanguard mutual fund is $3,000; and the brokerage account minimum is $3,000. There are two main ways of building a portfolio: 1) invest a lump sum amount or 2) invest a certain amount monthly. I'll illustrate both approaches. Notice that it's difficult to allocate my money precisely because I have to buy whole shares of ETFs and the prices are not whole dollars. But these illustrations show how I might build a portfolio using a pre-established design. In addition, I'd monitor the balances and make adjustments by buying and selling shares to get the right allocation in sync with my model portfolio. I've studied the investment returns of simple portfolios (such as The Coffeehouse Investor portfolio) and noticed that the growth is not very exciting. What I've learned is that such portfolios are not supposed to be exciting. They are created in the hopes of providing steady returns, not spectacular ones. They are built to offer a blueprint that is easy to maintain, one that can be followed in good times and bad times, one that allows me to ignore market fluctuations and just keep investing. They are for the lazy, oblivious, and steadfast investor. Note that market index funds can be purchased from other providers besides Vanguard (such as Schwab and Fidelity). These are often available with low or no trading commissions and low expense ratios. But financial literature tends to promote Vanguard as its founder (John Bogle) spearheaded the index-fund movement. Also, there are various ways of constructing a portfolio, including various allocations of stocks and bonds. In general, stocks are riskier and more volatile so as I move closer to financial goals (such as retirement), the more the model portfolios can be skewed toward bonds. Finally, none of these portfolios are guaranteed to deliver a certain investment performance. None are made with my particular situation in mind. However, they may be useful in designing and building a low-cost portfolio, and controlling investment costs is an important aspect to accumulating wealth over time. I have a very reliable and safe monthly pension. Could I view that as a “bond-like” investment and free-up a little more money to invest in stocks?